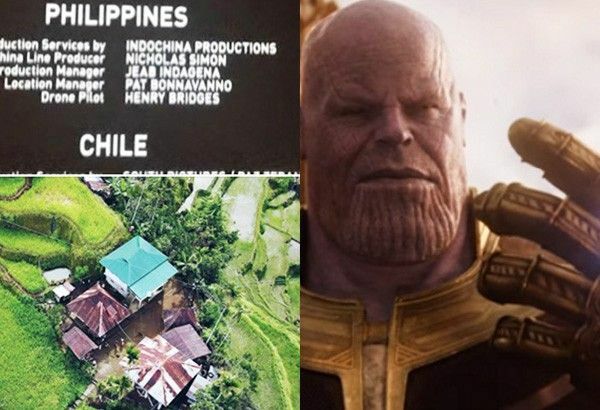 The Philippines' Banaue Rice Terraces and the Philippine team in the credits of "Avengers: Infinity War (left); Josh Brolin as Thanos, whose 'retirement' scene features the terraces. MANILA, Philippines — Giorgio Tsoukalos, host of “Ancient Aliens,” a TV show that aims to explain how extraterrestrial life presumably helped people from the past build things like the Pyramids of Egypt, said that the Banaue Rice Terraces was purely built by Filipino ancestors. “You don’t need extraterrestrial technology to do this. In my opinion, there is nothing extraterrestrial about this. It’s not really difficult to do. This takes a lot of time and a lot of people but definitely possible,” Tsoukalos told Philstar.com during the recent History Con event in World Trade Center, Pasay City. Nonetheless, he admitted that there is something in Philippine mythology that caught his attention. At the National Museum of Anthropology in Manila, he learned about the Maranao epic, Indarapatra. “I had a great chance to go there for the very first time and I encourage anyone living in the Philippines to go to your museum of anthropology,” he said. “It says that this man was given several concessions, which include a horse who’s as intelligent as man and speed that was faster than lighting; a golden bird who could transform itself into both human and non-human form; a pair of golden gongs that when struck the tone could make women in the middle of their pregnancy deliver prematurely; a magic kerchief that gives the possessor anything he wishes for when flicked; a magic boat; and to be born immortal, enabling him to return to heaven anytime he wished,” Tsoukalos explained. Such a description, according to Tsoukalos, is a “misunderstood technology” that could be ahead of its time.